It is time to right a wrong. The rescue of Spinjitzu master Sensei Wu must take place now, and help is needed. Sensei Wu has been taken and the nunchucks of lightning have fallen into the wrong hands. This could spell disaster if action isn't taken immediately. The nunchucks of lightning were made from the Golden Weapons and were ferociously watched over the by dragon that guarded them. 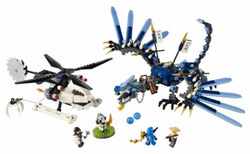 The Ninjago Lightning Dragon Battle from LEGO will let kids of all ages restore order to the ninja world. The mini figures of the Ninjago all have names appropriate for their personality traits and are different in facial features. Your figure is either a Hero or is part of the Skeleton Army but be careful, there are mighty weapons at play here and they're not for use for those who don't have the knowledge to understand the power. Luckily the Ninjago system has been updated and brought into a more modern time period because this system has the presence of vehicles such as your attack helicopter. In the Ninjago Lightning Dragon Battle from LEGO, your skills are urgently needed to bring freedom. Fight alongside Jay, the Ninja of Blue Lightning and defeat the terrible Lightning Dragon to bring Sensei Wu back where he belongs. The fate of the Golden Weapon is at stake and if it's brought to the Underworld all hope will be lost. But watch out! The enemy is as crafty as they are strong and it won't be an easy fight. The helicopters are prepared with jaws that can snap and easily destroy a ninja. The flick missiles are designed to fight back rapidly and without remorse. Frakjaw, the Red Skeleton of Fire doesn't attempt to hide his evil intentions and he won't fight fair in the battle so prepare yourself ahead of time to remain focuses and fight like the ninja that you are. The Ninjago Lightning Dragon Battle from LEGO is packaged with the helicopter and its pilot and has a turn crank so the rotors actually spin. A total of four mini figures come with the set including Sensei Wu, Frakjaw and Kruncha. The weapons you'll get are the silver mace, the golden blade, two golden spears, a couple of large spears, and the lightning nunchucks. Technically the Dragon is a weapon too with his ability to toss out lightning balls with his mouth. Best of all, the Ninjago Lightning Dragon Battle set will keep kids busy and their imagination running on full speed through Christmas morning and well towards New Year! Too fantasical for your tastes? Look at the Lego City Police Station instead.